I was honored to present at the NEHA Anaheim convention on the topic – Proposed Standardized Restaurant Grading System Provides Sector Region & Health Department Comparison and the feedback received was heart-warming. The National Environmental Health Association (NEHA) Anaheim meeting was richly rewarding. The agenda was packed with great food safety information. And the contacts were immeasurable. There definitely is an encouraging interest, on behalf of the public health community, to strive for standardized restaurant grading and reporting. A California County has asked for our help in critically remodeling their website to make it more consumer friendly. Another California County requested we add their data to our database and provide some comparative national data for process improvement. 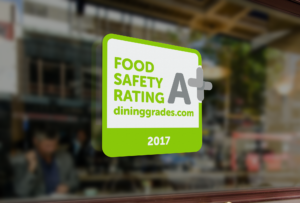 An eastern seaboard Director of Health and I have begun a dialogue to explore how to create a standardized restaurant grading using a reasonable demerit system based upon the 2017 food code. A Texas County asked to explore how we might independently create a standardized restaurant grading, so they would not have to recreate the wheel. Representing DiningSafetyAlliance.org, I had a chance to meet with FDA, CDC and NEHA leadership exploring how we might use the extensive DiningGrades.com standardized restaurant grading database in a national process improvement initiative. DiningSafetyAlliance.org and NEHA have begun a pilot project on creating a tool that can be used by health departments to anonymously compare their scoring, ratings and variance of data with others regionally or nationally. Finally, very importantly, I had a chance to meet receptive hospitality industry food safety leadership from Starbucks, Cheese Cake Factory, Yum and Darden brands to name a few. The NEHA national conference should be a must attend for Environmental and Food Safety leadership. I am certainly glad I was there.